is an artist’s worst fear selling their work? A friend was recently horrified when her painting sold at a gallery before she could “say goodbye to it”!? Of course, she was pleased that someone (a complete stranger) liked her work and could see themselves enjoying it for a while to come (enough to pay a decent amount of money for it) but the fact that we become attached to our creations is hard to deny. We may often feel that our work isn’t finished or good enough, and even wonder why anyone else would see any value or sense in what we do. But is this simply a manifestation of our own lack of self worth or the influence of the present societal disregard for the value of art and culture to our spiritual wellbeing? Fortunately I seem to not suffer too much from any of the above ‘ailments’ and cannot rightly understand why my works of pure creative genius and beauty are not snapped up the minute they leave the easel??!! I am more often overwhelmed with wonder at the shear scope, skill and diversity shown in my humble paintings and offered at such a reasonable price too! A recent visitor to our studio asked me to explain my work. I said I didn’t actually know what I was doing. That there was no particular symbolism invloved! I am not telling stories. Simply making marks with and on the materials I use. (She was horrified and went on to tell how she only liked pictures of horses!!??) However, I am interested in making things with the materials I gather – natural materials or things we might otherwise throw away – learning about them and how we can put different things together through making. I enjoy nature, history, geology. I like not knowing how a work may turn out. I am inspired by the results and where they may lead me next. I was recently invited by the popular television property show ‘Escape to the Country’ (Freemantle Media) to help with a local interest article about Bideford Black. Despite very inclement weather for August we spent an enjoyable morning on the beach and cliff top near the outcrop of pigment, accompanied of course by a chorus of local ravens, oystercatchers, gulls and a single peregrine falcon. The presenter, Alistair Appleton, was completely surprised by the ‘blackness’ and quality of the pigment and became quickly absorbed in his brief painting experience. It was fascinating to see behind the scenes, work alongside the team for a while and also get an opportunity to share my work with a new audience – the show reaches about 16 million people! It will be broadcast on BBC2 sometime during the next few months. 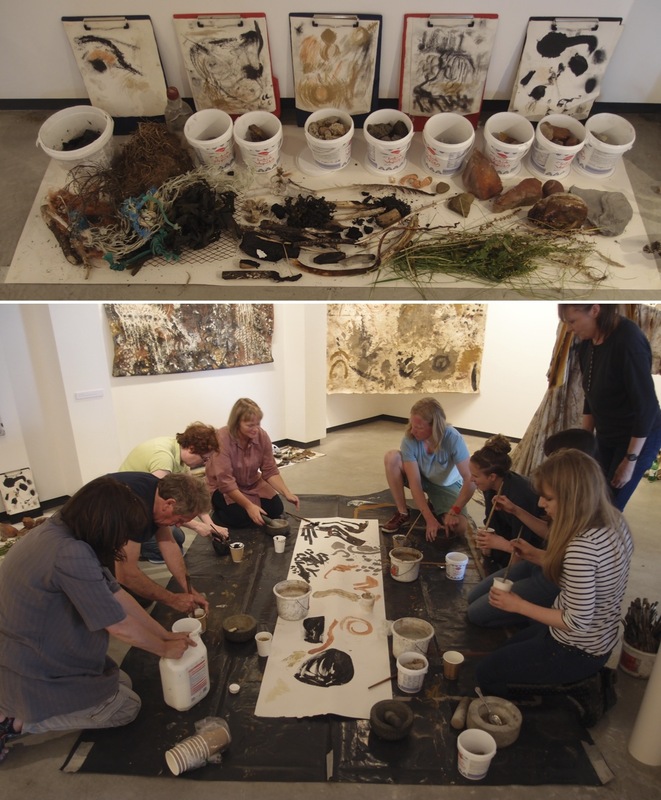 To accompany our[i] recent exhibition, painting together, at the White Moose Gallery[ii] in Barnstaple, we offered three workshops to explore the possibilities of creative collaboration through painting with local earth pigments. The first two workshops consisted of morning visits to prominent pigment sites followed by afternoons making paint and painting together on a shared canvas in the gallery. 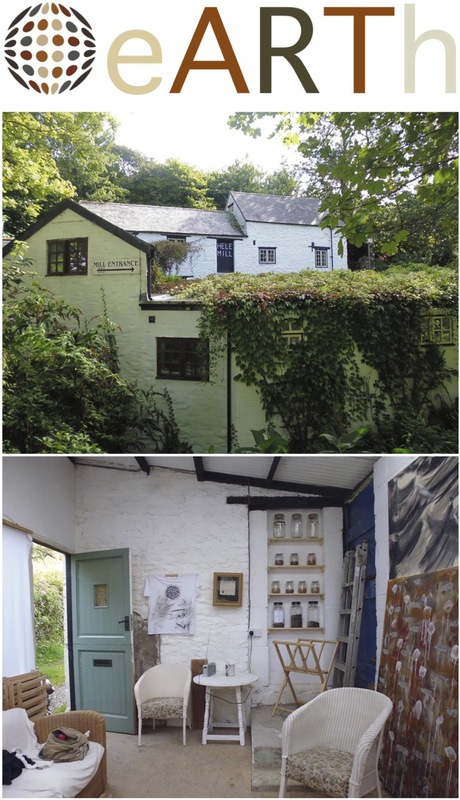 The third workshop was spent entirely in the gallery and looked closer at paint making techniques before using rocks and soils gathered in the previous outings to work with. 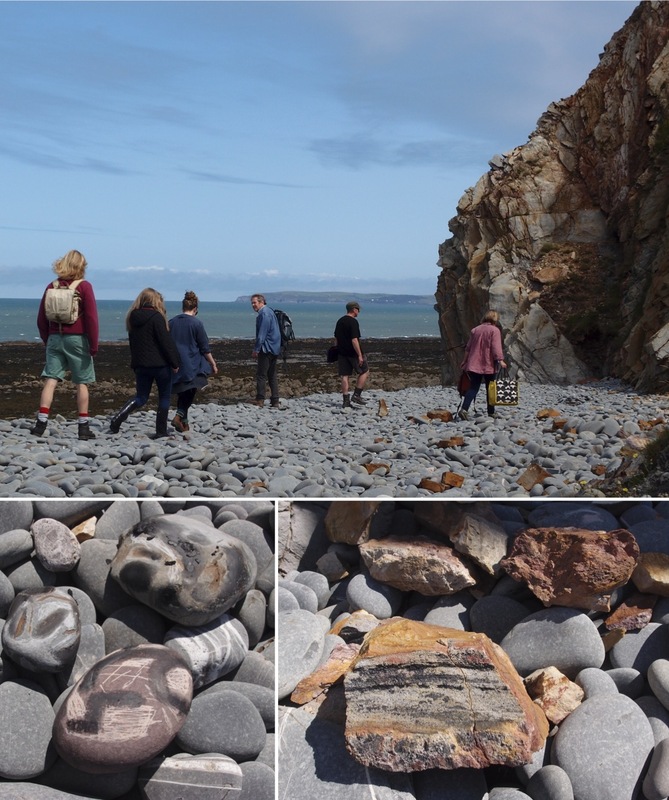 North Devon has an extremely rich geology – a combination of Devonian, Carboniferous, Perma-Triassic and more recent glacial deposits – that has shaped the way we have and still relate to the environment. Glacial clays have provided excellent material for local potteries. Copper, iron, sliver and tin were mined on Exmoor. Culm grasslands have offered fertile grazing for beef, dairy and other livestock. And different earth pigments have been extracted for both industrial and artistic applications. Bideford Black (and anthracite) was mined across the region until 1969, while raw umber was extracted from locations around Combe Martin[iii]. But wherever we go there is always an incredibly varied spectrum of earth colours to be used, representing and celebrating sense of place however we choose to express ourselves. Sharing a surface to work on – in this case a previously prepared canvas – was found to be a fun, if sometimes frustrating, but rewarding and liberating experience. 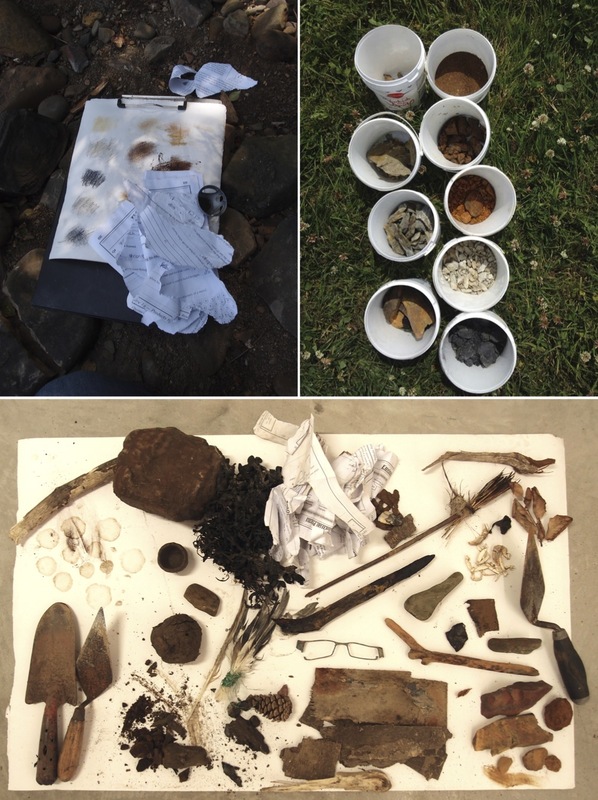 Sharing the whole experience – gathering pigments, making paint, sharing lunch and conversation, working on a communal surface and finally reflecting on the day – offered new ways of working beyond the more often isolated practice we enjoy. It’s not for all but can help shift our practice as artists into new areas, seeing how others work, observing our own methods, habits and expectations from a different perspective and raising interesting questions of ownership, value and public perception towards communal ways of working. A first impression of Fremington Quay may be that of a fairly non-descript quay on the bend of a muddy estuary. However, when we look a bit deeper a rich history is evident. It was once one of the largest ports in the southwest, exporting iron, wool and clay, amongst other local products, around the world and importing coal and lime from South Wales. Until recently the Quay was a major railway siding, replaced now by the Tarka Trail cycle path extending from Barnstaple to the Ball Clay quarries at Meeth and Peters Marland south of Torrington. Its history is excellently displayed in the newly refurbished museum at the equally excellent café in the old station building. The Quay sits broadly on the meeting of the Devonian (450 million years ago) and Carboniferous (350 million years ago) geological eras, a weakness in strata marked by the River Taw’s meandering intersection. The underlying carboniferous shales, slates and mudstones of the Crackington Beds, extend west to Hartland Point, and are capped on the southern banks of the estuary by glacial deposits from the Flandrian Ice Age 40,000 years ago. All this creates ideal conditions for the amazing array of pigments to be found along the low cliffs beyond the large disused stone limekiln west of the quay. A few miles inland Fremington clay pits provided fine red clay until 2013, helping establish and maintain the local potteries in Barnstaple and Bideford. The clays were laid down as sediments in glacial lakes and riverbeds. The folds, cracks and twists in the sedimentary carboniferous rocks allow for oxidization of minerals, offering an exquisite range of colours and textures. Some have said that in other countries the site would be considered a national heritage site. For now however it is protected as a Site of Special Scientific Interest. I first came across the site when walking my dog many years ago, noticing the fantastic colours and rocks. However, it wasn’t until I started seriously researching earth pigments that I actually touched the rocks and found the colour. I have since visited with eminent geologists form the Ussher Society and Devonshire Association to learn more about it – although to be honest I wonder if I have not become just more confused, each ‘expert’ offering a different theory of the areas formation, age and make-up. For the painting together workshop the participants were bowled over by both the area’s history and geology and the amazing array of colours available. 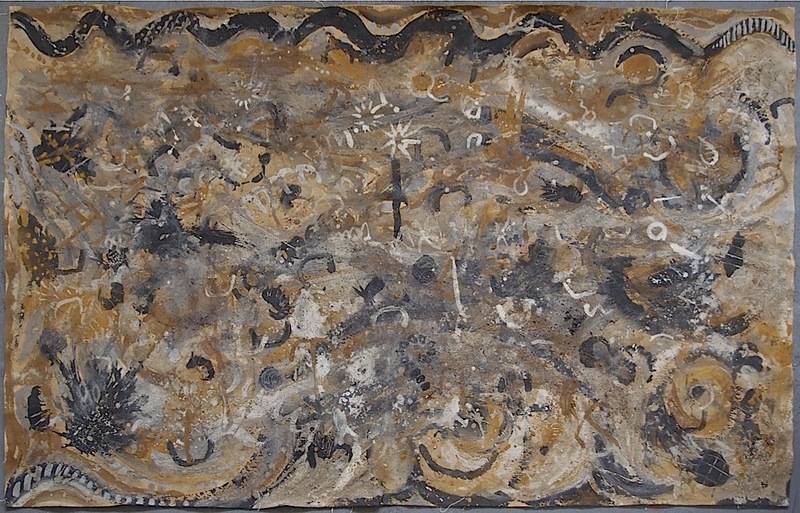 The painting we made is, I think evidence, of the lively experience and the richness of the site. It was subsequently hung in the Create Centre in Bristol as part of the Soil Culture exhibition. 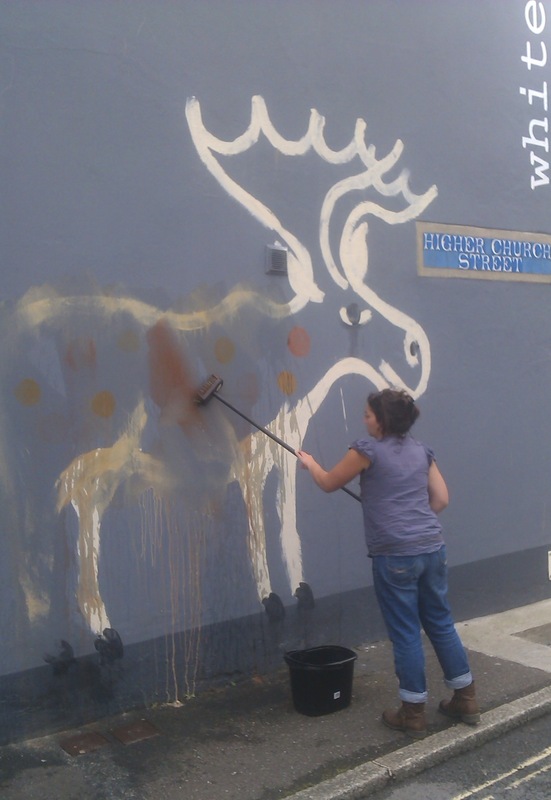 Bideford Black has become popular among artists recently, after numerous projects focusing on its local significance and artistic potential. This workshop was therefore, not surprisingly, well attended with 10 participants and thankfully the weather was glorious. 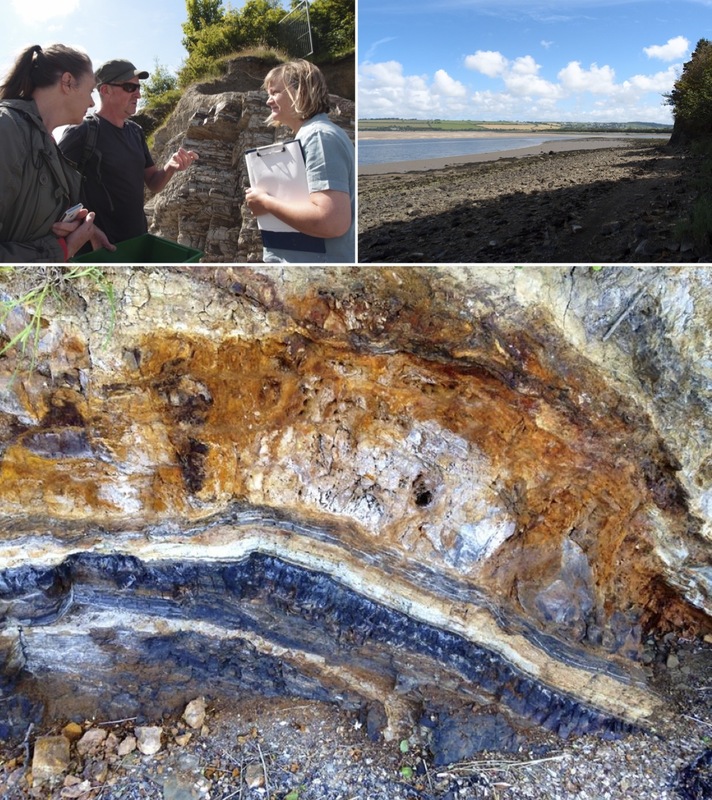 While the Bideford Black deposits exposed at Greencliff were the main attraction, there is a good range of other usable pigments easily accessible from the attendant sandstones and clays – white, grey, orange and pink rocks and clays were gathered, along with other beach detritus, and taken back to be enjoyed in the afternoon painting session. There being more people made for a quite chaotic and crowded painting together experience, with two smaller canvasses being provided to take a specific place in the White Moose show. Limitations and parameters are an important aspect of any creative process and these were discussed at length within the context of the day’s workshop. Participants ranged from experienced artists and students to designers and other interested parties. Again the results and insights gained were an exciting reflection on the site, its history ad geology, the materials and the day’s events. 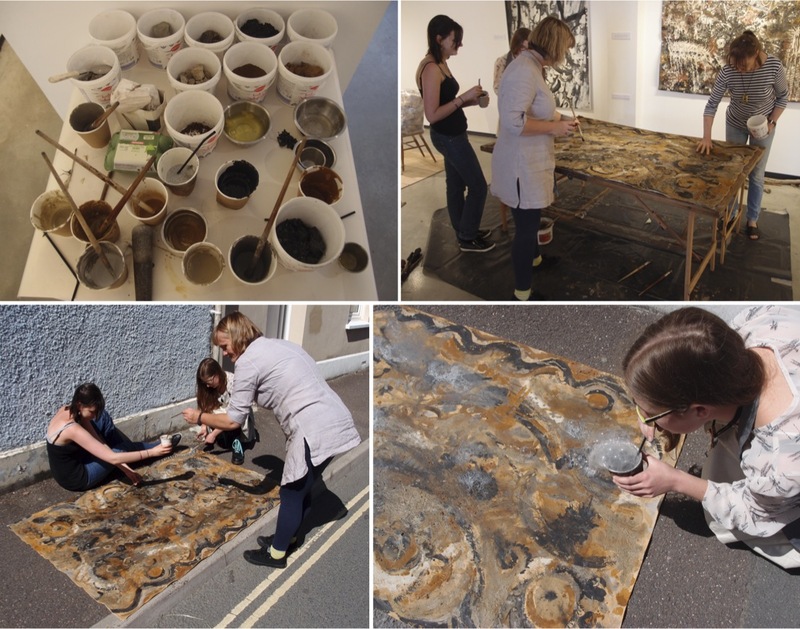 After a brief overview of previous workshops and introduction to the materials, the final workshop experimented with various methods of paint making including using egg tempera, gum Arabic and PVA glue as binders. As a theme we focused on water and the sea. The rocks, clays and soils we were using were predominantly sedimentary, being laid down thousands and hundreds of millions of years ago under the ocean, by rivers, in lakes or by ice in glacial times. This is an idea that Francesca and myself are both interested to investigate and participants were happy to indulge us. 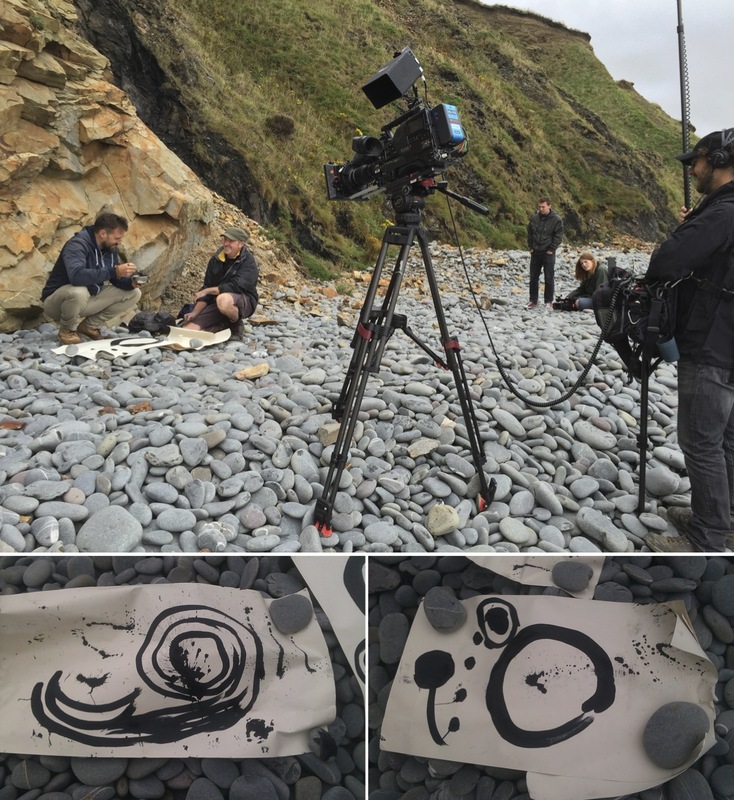 The group shared their own experiences and relationships with water, and more specifically the sea, and continued to use this as a focus for mark making, imagery and discussion throughout the process. We thought of immersion, of healing, of play, of floating and sinking, of mysterious and murky depths and of a power wild and untamable. We painted creatures and waves. We blew bubbles. We wallowed in mud. One of the challenges was to paint the sea without the colour blue! 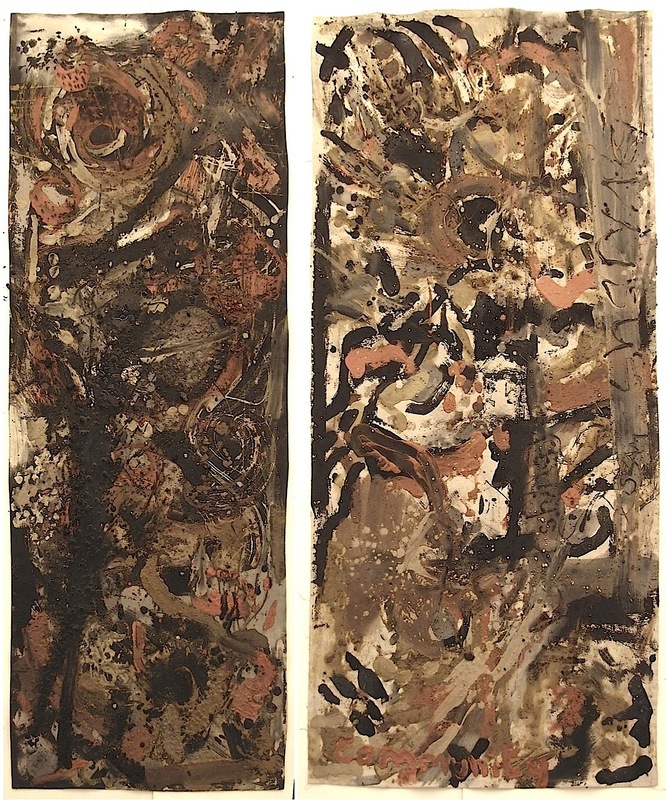 The paintings success for me lay in its obscurity, its vagueness and shifting focus. Were we beneath the sea or floating in primordial swamp, part of it or separate? Its hard to tell, but we had a great day making it. Many thanks to Karen and Stella and to all those who took part in the workshops, to all who visited and enjoyed the exhibition, to all who contributed to the work and especially to the White Moose for hosting the exhibition. Unfortunately, we didn’t sell any work and had to cancel the ‘in conversation’ event through lack of interest but maybe that is a sign of the times or of a prevailing attitude in North Devon towards more contemporary/conceptual art forms but also an interesting reflection on people’s response to communal work. But whatever each time we entered the space we felt extremely proud and pleased with the show, with the work we had done together and the experience we had offered all who took part. We have thoroughly enjoyed it and hope to take the show further afield in due course. [iii] According to local sources “no paint box was complete without Berrynarbour umber.” The pigment was mined until the 1790s and ground with ochre from East Down before being sent to London to be included in Reeves paint boxes. I have taken umber from the River Umber that runs through Combe Martin but as yet I have not located the quarries where it was mined.